We’re talking about something beautiful and sacred here, and that’s exactly what the boys from the Colorado-born “Future Funk” unit known as Lettuce achieved Saturday at Denver’s Boettcher Concert Hall when they performed some of their best and most enduring work with the Colorado Symphony. Under the fiery baton work of the young, but already highly accomplished Australian conductor Christopher Dragon, from the selection of material to the inspired orchestration, to the performances of each and every human onstage, it was an ecstatic evening. 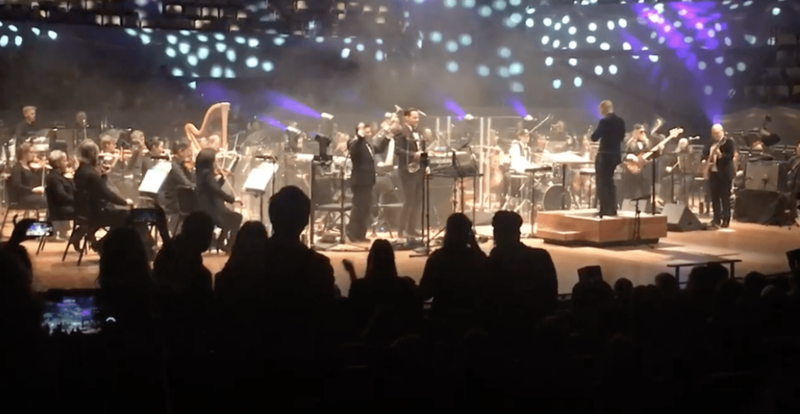 It was also clearly an elevating experience for everyone involved: the band members, conductor, orchestra musicians, and audience were all beaming and glowing with smiles that just kept getting more beatific through the evening. Part of that bliss probably had to do with this type of show being a first for the band: at one point, keyboardist/vocalist Nigel Hall said something like, “If you’d told me a year ago that I’d be playing piano with a symphony orchestra…” I missed the rest, as people around me started whooping and screaming. It was a first for me too, as in all my decades of concerts, I’ve never seen a rock band play with an orchestra. As such it was difficult to imagine beforehand what the experience would be like, though knowing how great Lettuce are live and being already familiar with our local treasure of an orchestra, I would have been surprised if it weren’t one of the high points of a lifetime of great shows I’ve been privileged to attend. And sure enough, the only way I was slightly surprised was that the evening exceeded my fondest hopes and expectations. From the opening Lettuce original “Mount Crushmore,” all the way through “The Force,” the last piece in the first set, the way these musicians combined classical precision with the spontaneous fire Lettuce excels in was outrageously wonderful. As layer upon layer of sonic beauty and power was added to the creation, it was an almost overwhelming experience, causing us in the audience to make almost as much noise of our own as we did at Lettuce’s incredible concerts at Red Rocks back in June. Speaking of Nigel Hall, as great as he is on the keys, that man can really sing. It’s always one of my favorite parts of a Lettuce concert when he opens up that voice, but on Curtis Mayfield’s “Move On Up,” Hall really outdid himself. The song was a perfect choice for this setting, as the original’s string and horn parts were expanded to spectacular effect, driving an already uplifting song to stratospheric heights. This feat that was repeated in the second set’s cover of Tears For Fears classic “Everybody Wants to Rule the World,” another brilliant selection for an evening of orchestral funk-rock. In the middle of “Move On Up” though, we got an extra treat as things got considerably quieter and Hall sang a deeply soulful, gospel-tinged interlude about love, belief, and… I don’t remember everything he sang about, but the extended moment definitely fed my soul. It also felt like possibly the most improvised segment in a program that, by necessity, had to have been pretty tightly arranged. Singing something that powerful and moving in a nearly a cappella setting while allowing oneself to at least partially make it up on the spot- that’s not an easy thing to do and Mr. Hall deserves our appreciation for sharing that gift with us. Screengrab via YouTube user coloradojohnsons. Everyone onstage was in top form: drummer Adam Deitch, guitarist Adam Smirnoff, the always fun to watch bassist Eric “Jesus” Coomes, saxophonist Ryan Zoidis and trumpeter Eric Bloom all performed with joyous brilliance. Mr. Dragon led the orchestra with zest and panache, and the orchestra itself was unparalleled. Extra special credit must be given to Tom Hagerman, who has been getting notice as a film score composer outside of his 20 years of work as a member of Colorado’s legendary band DeVotchKa, for his masterful orchestrations. His talent proves that those who work behind the scenes are often as important and essential as the performers themselves. And what a lot of work must have gone into this production! We can only hope that everyone involved felt our love and gratitude throughout the concert and the multiple and richly deserved standing ovations. 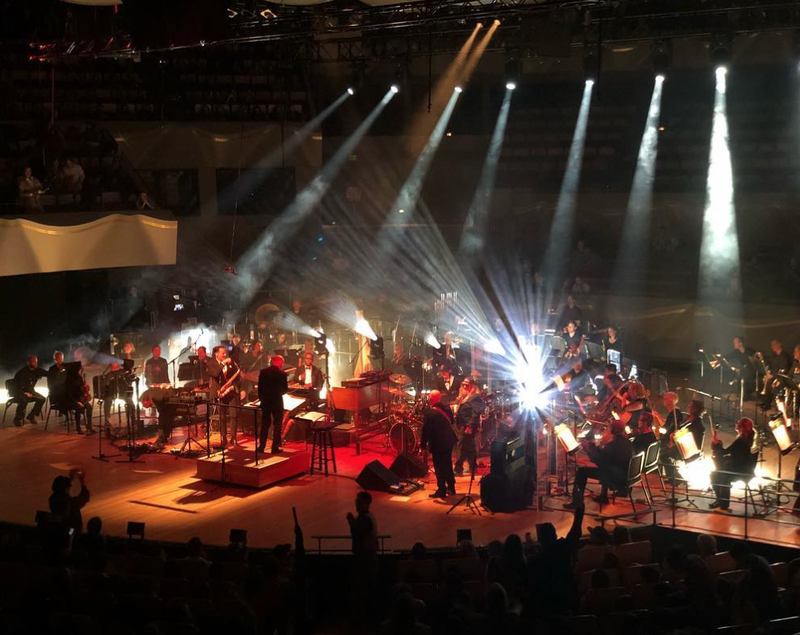 The Colorado Symphony have previously done collaborations with Elephant Revival, Warren Haynes, and others. But on behalf of myself and everyone who was there Saturday, here’s a humble request that they do it again with Lettuce! Next up for the band is a three-night New Year’s run through Houston, Dallas, and Austin Texas. Their 2019 Vibe Up Tour begins in January, with support from Ghost-Note and Greyhounds. For all Lettuce tour dates and news, visit the band’s website here.